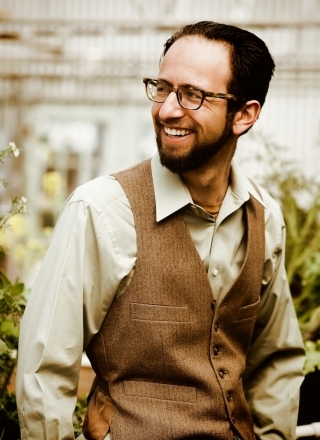 Adam Brock is a permaculture designer and teacher based in his hometown of Denver. Since 2007, Adam’s work has explored the intersection of urban agriculture, social justice, and sustainable business in an urban context. In 2009, he co-founded The GrowHaus, a food justice nonprofit in Denver that has become a key hub for Denver’s local food movement and received numerous awards for its work. Adam is a member of Denver’s Sustainable Food Policy Council and was named as one of Colorado’s Top Thinkers of 2013 by the Denver Post. He is currently Director of Social Enterpise at JVA, and is the author of the forthcoming book, Change Here Now: Permaculture Solutions for Personal and Community Transformation, to be published in Summer 2017 by North Atlantic Books. Adam’s credentials include a B.A. in Ecological Design from New York University’s Gallatin School of Individualized Study, a semester certificate from the Ecosa Institute, a Permaculture Design Certificate from Andrew Faust, and a Permaculture Teacher’s Certificate from Dave Jacke. He has studied under many noted permaculturalists in the United States, including Toby Hemenway, Larry Santoyo, Peter Bane, Jerome Osentowski and Eric Toensmeier. Creighton Hofeditz grew up in Morrison, Colorado and obtained an B.A. in theater and communication before switching paths with a permaculture design course at the Central Rocky Mountain Permaculture Institute in 2011. He worked with Peter Bane during the editing process of The Permaculture Handbook and has since designed home landscapes, a highway exit, and a farm school curriculum. Recently he was a contributing author on Jerome Osentowski’s book The Forest Garden Greenhouse and served as the intern coordinator at Bullocks’ Permaculture Homestead in Washington State. He’s placed special emphasis on greenhouses, perennial plant propagation, and community education, and has put that to use in his full time job as a middle school teacher at the permaculture-influenced Denver Montessori Junior/Senior High School. He is the current president the Denver Permaculture Guild and loves the challenge of crafting unique, elegant, well-patterned systems in any environment.